Armored templars. Zombies. Partisans. Nazis. Does anything else really need to be said or have I sold you the idea of larp already? Its name comes from a tabletop Italian role-playing game (read about it here), but basically it's the alternate history 1957. The world got changed forever when in 1944., on the D-day a zombie apocalypse happened. The larp will be run in the western Istria, in an abandoned village near the town of Buje. It will be a 12-hour larp, starting on June 13 at 14:00 (with a prep time couple of hours earlier), and ending on June 14, 02:00. Semantics and cultural assumptions are some of the biggest enemies of being understood when talking about larp terms, and "convention" is one of the worst culprits. There have been many larps and larp related stuff already this year. Both stand-alone events and the great experience that was PoRtaL (btw, that article also got translated into Italian by +Andrea Castellani, and a revised version should be up soon on larping.org). But the season fully kicks in tomorrow when stuff will happen continuously until in summer. The small town of Pazin in the middle of Istria is a host to the second largest Sci-fi & Fantasy convention in Croatia, Istrakon. It starts today and lasts for the weekend - this year's incarnation is called "Elementi". The larp related stuff will be tomorrow evening - two things happening simultaneously at 8 PM. Izgon larp updates, The Monitor Celestra, and larp videos! Social positions of the NPCs in the worldMannerisms and etiquette of the historical period in which the game is roughly placedAre there any differences between PCs and NPCs?What does being fantasy mean? These sound like quite interesting subjects. Are you going to be there? Feel free to comment on this post and mention how it went. Just a quick update for today. Yesterday was Krvomeđe. With the weather being somewhat wet, a total of five players showed up. Unfortunately, I was not there either as other things came up. But I heard they had some fun. Apparently there was an archery contest, and some battles. Next event will be not Krvomeđe, but Sunčev Kotar in two weeks. It's a third event in the series - first Sunčev Potočić was a small feast in late autumn of 2010., second one was in March last year by Green Banner Croatia, and the third one will be on March 23rd, in shared organization of Green Banner Croatia, Krvomeđe and Ognjeni Mač - a similar model to the one used on Crolarp last year. It will once again be organized in Eko Selo Žumberak. More info here (in Croatian). On the same date there will be Istrakon, one of the largest sci-fi conventions in Croatia in the town of Pazin. It should also have some larp content on it, such as another run of Koliba (The Cabin). If you don't understand Croatian, it's basically a general description of what larp is. It was shown this Friday afternoon on HRT2, and it had a rerun today around noon on HRT3. In better resolution than what they released for online viewing, but I digress. You can watch the entire show here if you're interested. Just select the 8.3.2013. date. Also, a digression - a friend of mine dug up some old photos. 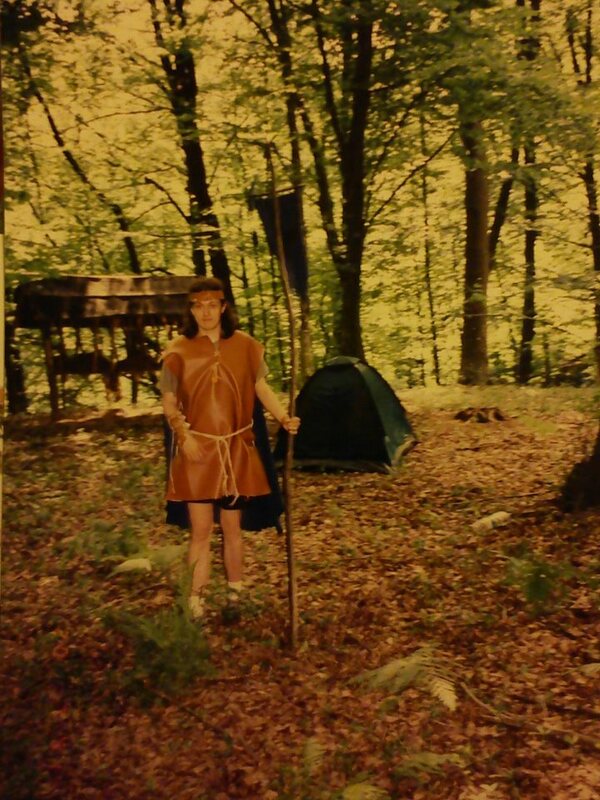 Including the photo of me from the first larp I was ever on. We found the new location, and prepared for the game to start. There were some delays as some people were late and busy armoring themselves up, and GMs wanted to start with everyone around here. The story was a continuation of that on Maksimir 63 - true to it, it was also in a different in-character location. There was a funny looking village in front, one half of it burned. Basically, after some chatting with the villagers the demons attacked. Apparently, some portals to Hell got opened. Except the demons, there was also fighting between some players. Sorting out our differences. We tracked the demons to a large hellgate. Most larp groups are usually concerned with low ratio of female to male players. On Croatian larps, this has historically been somewhere between 10 and 40 percent of the larping population - depending on the larp in question and when it was played. "The Larp Group" which I'm a part of - we did the live panel on Hangouts recently, if you remember - is meeting once again in ten days. I'll join Kaza "Larp Girl", Callie and Martin on Saturday, March 16th and it will be broadcast live on larping.org youtube channel, like last time. If you live in USA on the east coast, it will be one hour earlier than the previous Hangout - at 11 AM EDT. If you're in Europe, it will be TWO hours earlier - at 16:00 CET. The reason for this is the USA switching to daylight saving time earlier (March 10th) than us Europeans switching to summer time (March 31st). We'll be discussing how to get started on larp, and our personal experiences. The day started with goodbyes. After we fed our guests with some burek and yogurt (well, they have to get the authentic experience), our guests left. Hungarians back towards the border, and Rebecca to her family - and then off to Samobor where a reenactment battle was being held. I'd probably go there if there was no PoRtaL this weekend. Many hugs were exchanged, and after a quick shower I was back on my feet - and off to the convention. The morning started with some hands-on stuff. Brittany and Sean, an American couple who did the SCA presentation with Rebecca yesterday, were teaching us how to make the authentic medieval stuff. At the same time, there was another acting improvisation workshop - this one by Andrej Štefan. Get the English version of the larp here.